The Wildlife Rehabilitation Center of Northern Utah has been caring for sick bald eagles since the beginning of the month, each of them succumbing to a mystery illness. Something is killing bald eagles in Utah, and wildlife officials are scrambling to diagnose the mysterious illness before it spreads. At least 16 bald eagles have died since the beginning of the month, with another rescued bird likely facing the same puzzling fate, state wildlife officials said Tuesday. 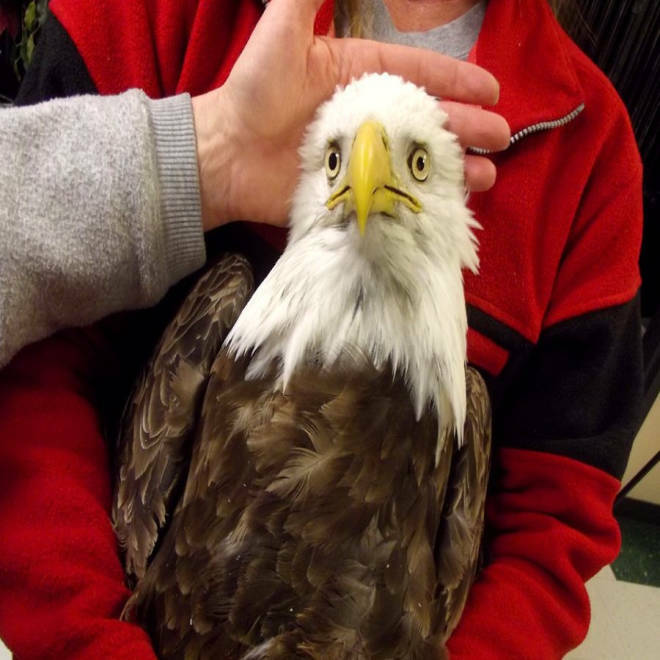 About half of the bald eagles identified since Dec. 1 were discovered dead, while the other half died or were euthanized at rehabilitation centers. A lab in Madison, Wis., is conducting blood work and toxicology screenings, the results of which may not be available for a couple of weeks, said DaLyn Erickson-Marthaler, executive director of the Wildlife Rehabilitation Center of Northern Utah. The bald eagle population has flourished since it was considered an endangered species in 1967 because of a loss of habitat, hunting and DDT poisoning. The number of breeding pairs in the lower 48 states grew from an estimated 417 in 1963 to more than 7,000 in 2005, according to the U.S. Fish & Wildlife Service. The birds were taken off the federal government's endangered species list in 2007 but remain federally protected. One possibility being considered is poisoning, either intentional or accidental, although the affected birds have been found in different counties throughout Utah — not just one area. “This is hard to treat because we don’t know exactly what it is,” said Leslie McFarlane, wildlife disease coordinator for the Utah Division of Wildlife Resources. She added that officials haven’t noticed similar symptoms in other animals. Before they die, the bald eagles are found to have weakness in their legs, which turns into paralysis of one leg and then the other, said Erickson-Marthaler. The birds also experience head tremors and then seizures. They typically die three or four days later. The latest bird taken in on Monday from Davis County was still in “pretty good shape,” although he had difficulty standing, Erickson-Marthaler said. Utah hiker Taylor Schulte said he found another bald eagle Sunday on a ski trail, capturing the bird’s erratic movements on camera. He and his father-in-law wrapped the bird in a coat and then took it home while they waited for wildlife experts to retrieve it, Schulte told NBC Connecticut. Wildlife officials advise people who find a bald eagle not to touch them, and to contact the Division of Wildlife Resources instead.